The Golden State Warriors won Game 2 of the NBA Finals, 122-103, on Sunday to take a 2-0 lead over the Cleveland Cavaliers. LeBron James had his second straight big game in a losing effort, scoring 29 points and just missing a triple-double, with nine rebounds and 13 assists. One play in particular perfectly sums up the Cavs’ hopes in the Finals: James made an unbelievable cross-court pass that went mostly unnoticed because his teammates couldn’t convert the play into points. Despite the mind-boggling pass, the play ended in a badly missed three-point shot, followed by two missed free throws. LeBron James had another tremendous performance in Game 2 of the NBA Finals on Sunday – but once again it was all for naught, as the Golden State Warriors won easily, 122-103, to take a 2-0 lead in the series. One play in particular seems to perfectly sum up the Finals, especially James’ lack of help and the Cleveland Cavaliers’ dwindling chances of pulling off an upset. 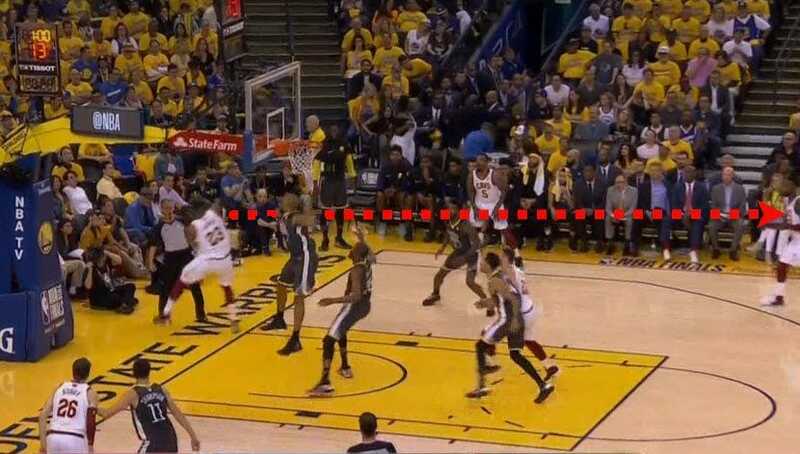 Late in the third quarter, James drove the lane and threw a no-look cross-court pass to Jeff Green that hit him perfectly in the middle of the chest. Green then quickly fed J.R. Smith for a wide-open three-pointer. Not only was James’ pass perfectly aimed through a crowd while he fell out of bounds, but he did it with a ton of zip. But like in the rest of the NBA Finals, the Cavs couldn’t convert on James’ incredible play. Smith’s three wasn’t even close, and Larry Nance Jr. subsequently missed both free throws after he grabbed the rebound and was fouled. Because the Cavs ended up not scoring on the possession, the pass went mostly unnoticed. The announcer Jeff Van Gundy mentioned it briefly, long after the play ended. In the replay, you can see just how perfect the pass was. It’s one that few would dare try and maybe a handful of players in NBA history could pull off. James had his second straight big game in a losing effort, scoring 29 points and just missing a triple-double, with nine rebounds and 13 assists. Of course, this came after the gut-punch Game 1 loss on Thursday in which James had 51 points while George Hill missed a potential game-winning free throw and Smith appeared to forget the score. In other words, James can’t do it all himself, and the Warriors are likely to win this series simply because he has little help.